Terry Tempest Williams’s thoughtful, melodious meditations on the contents of her mother’s journals. Terry Tempest Williams (Leap, Refuge, etc.) approaches a very personal subject in When Women Were Birds. The opening scene sets the stage: Williams’s mother, on her deathbed, directs Williams to her journals (of which the author was unaware). They turn out to be empty–and the rest of the book is a series of ruminations on this mystery. Williams contemplates the meaning of a person’s (or more specifically, a woman’s) “voice,” in the sense in which a writer might use the term and in its more literal sense. She contemplates mothers and daughters and the meaning of their relationship, sharing some of the traditions of her own family and of the Mormon faith in which she was brought up. She also shares anecdotes from her marriage, so that the book follows her (in nonlinear fashion) from her foremothers through her childhood and into the present. There are lots of women in this book, as well as lots of birds. Williams touches on serious topics–including abortion, environmental activism and ax murderers–but always with a respectful, quiet, lyrical tone. 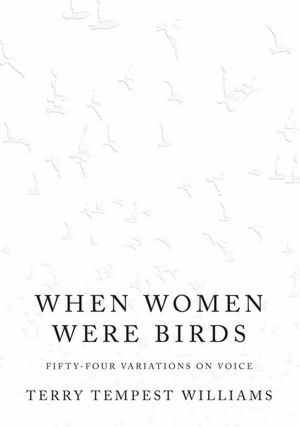 Often as much poetry as prose, and full of lists, quotations and letters, When Women Were Birds is truly a tribute to several generations of the strong, inspiring and interesting women of Williams’s tribe. It is a loving creation, showing all the musical, reflective intelligence we expect from Williams, and a lovely example of her own voice. This review originally ran in the April 20, 2012 issue of Shelf Awareness for Readers. To subscribe, click here, and you’ll receive two issues per week of book reviews and other bookish fun!